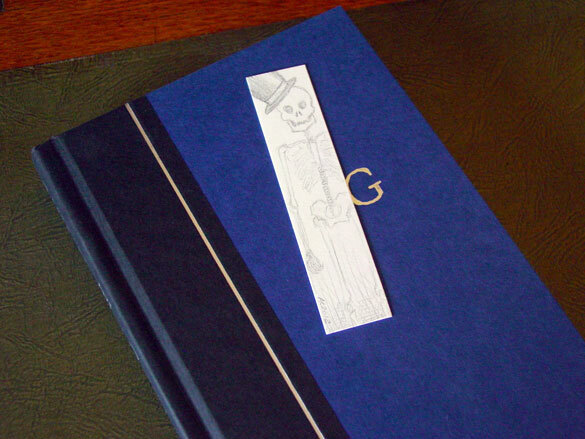 There was originally a skull bookmark in this set, and it wasn’t this one! That one got claimed by someone on my list, and someone else asked me to try to recreate it, so I did two more and she picked her favorite. So here is number three, pen and ink and water brush scribbled and smeared on comic backing board. 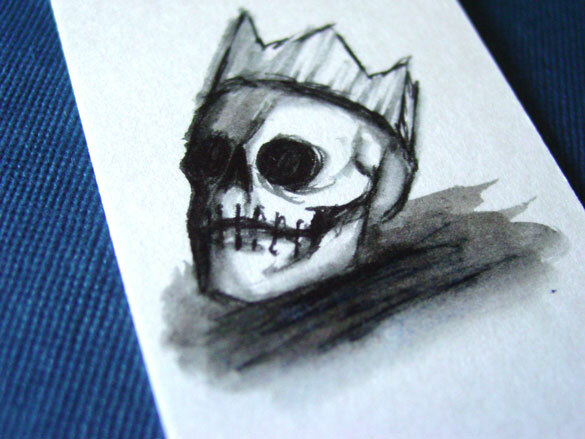 I ended up also doing a full-sized crowned skull as a result of all this thinking about it, which you’ll get to see this coming week. 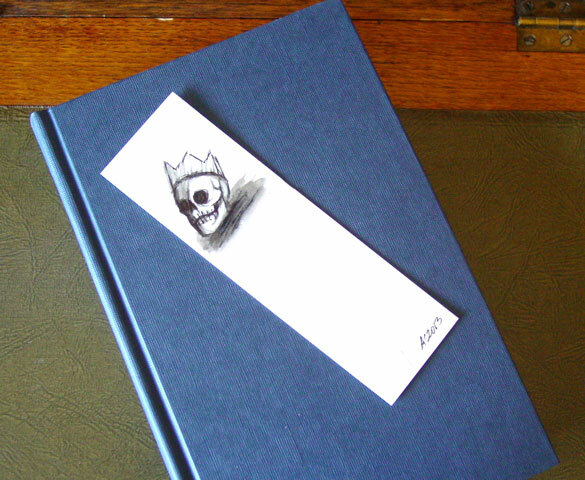 Skull Bookmark 3, 2″x6.5″ pen & ink and water brush on paper. 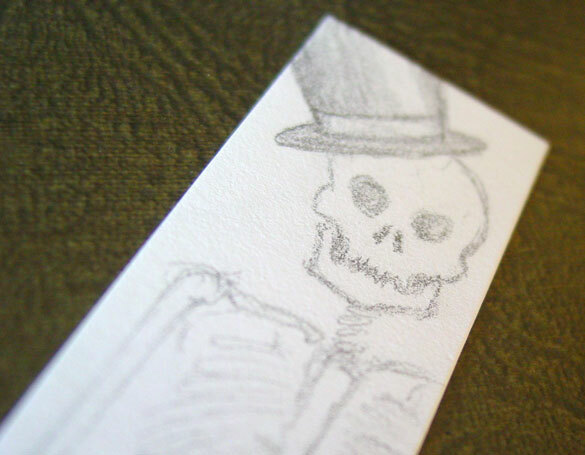 Above, you can see the skull itself up close. This ink tends to bleed out just a bit of blue and brown when it’s wet, so there’s a subtle undertone of color to the pieces that I really enjoy. 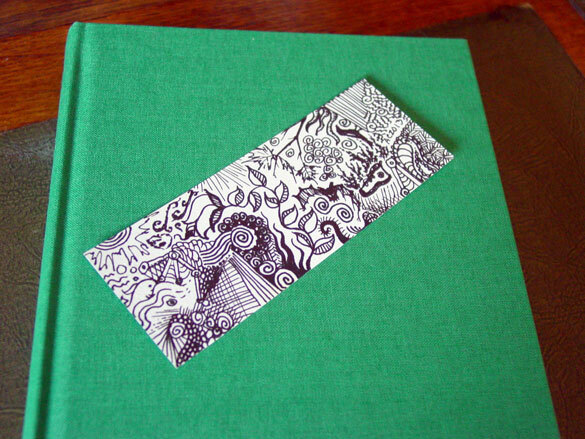 Below, it’s sitting with my trusty book, and you can see it’s one of the largest of this set. 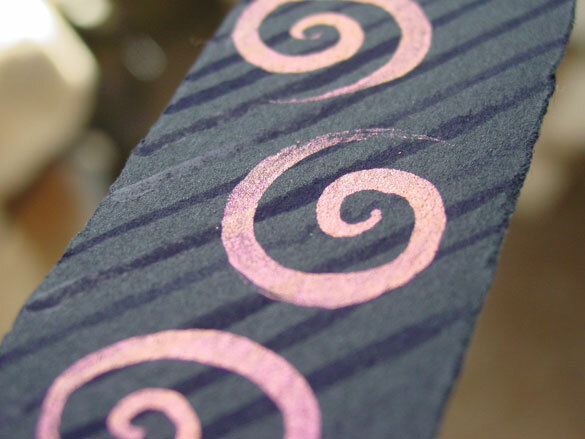 I couldn’t resist putting #7 on the 7th, so here are three lovely coppery spirals on a background of black paper with dark purple stripes. The paint is a metallic called “duochrome” that shows different colors from different angles, orangey bright from some angles and a more rose-tinted copper from others. 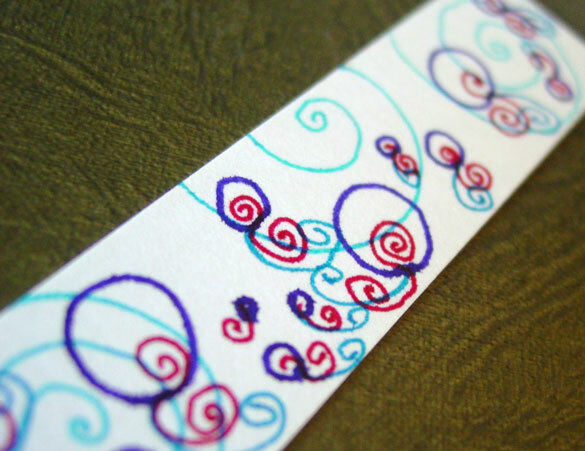 I suppose one of these days I ought to do a, “why spirals?” post, but I’m not sure I could adequately answer the question. 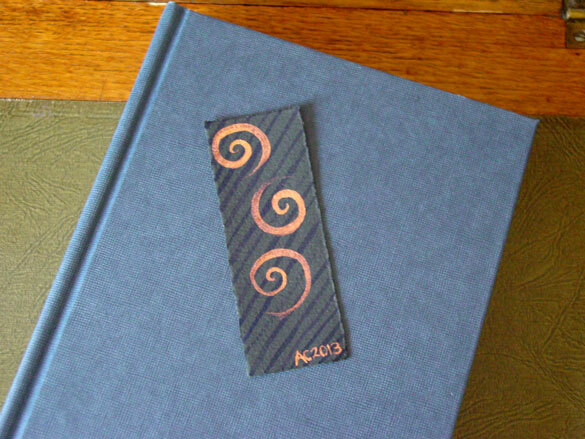 Spiral Bookmark 7, 1.5″x4″ watercolor on Arches cover black paper. 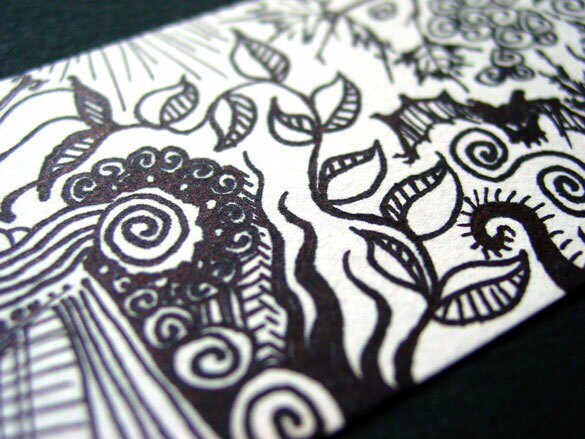 Above, you can see that I took this over to the window so you’d get the full effect of sunlight, making the spirals shine and the purple deep shadows against the paper. This soft paper is actually made for printmaking, and they create the black color with a chemical reaction in the paper pulp so it’s lightfast and won’t ever fade beyond the rich, deep charcoal. 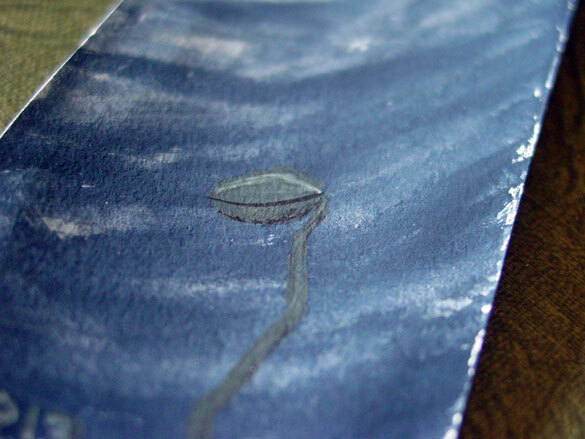 Below, you can see it hanging out with my book, being mysterious. 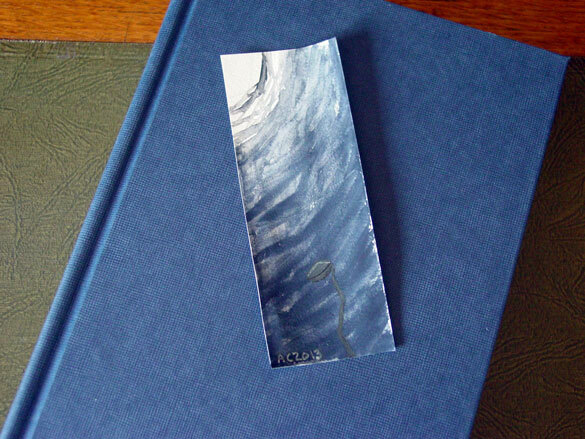 Today’s bookmark reminds me of sun on the ocean, lightening up the top layer that then gets darker the deeper it goes. 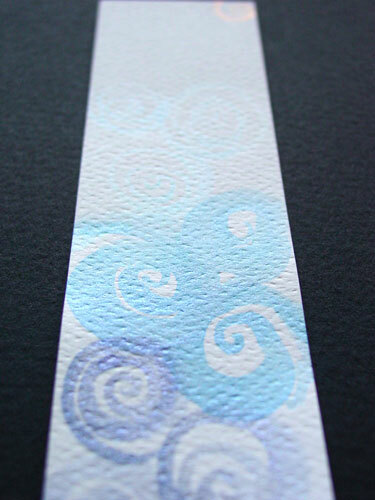 The sun is in a shimmery copper, while the ocean is three levels of three spirals each, from a pale aqua that my scanner loves to hate, through a brighter blue and then finally a soft greyish sapphire. All of the paints are iridescent, and catch the light beautifully. 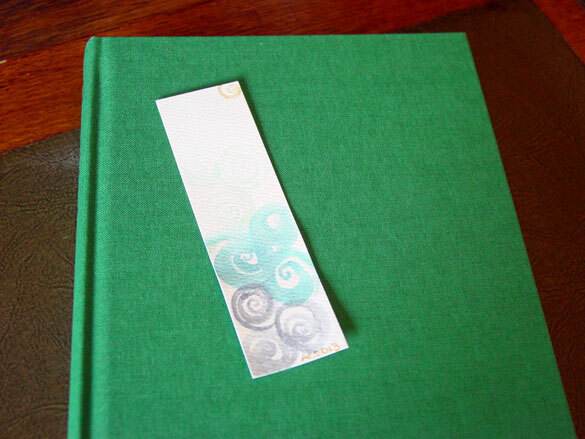 Spiral Bookmark 6, 1.25″x4.5″ watercolor on paper. Above, you can see some of the sun-changed colors and get a different hint especially of the deep blue and pale aqua. 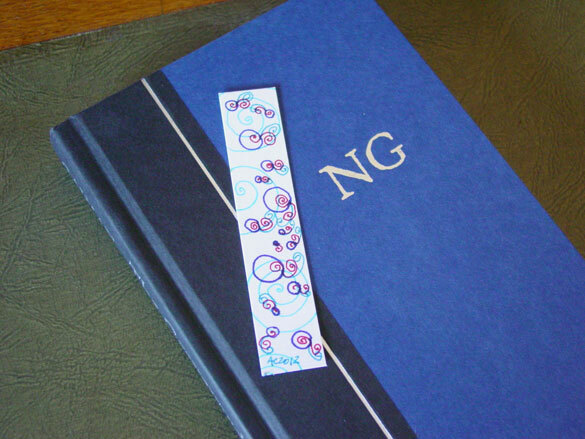 Below, you can see it hanging out with my trusty hardcover book.